Kogito Choko, renowned Japanese writer with dozens of literary awards to his name (including the Nobel Prize) is suffering from writer’s block. Suddenly his sister calls, offering him access to an old red trunk that is known to hold documents and letters of their father, who drowned when Kogito was a small boy. 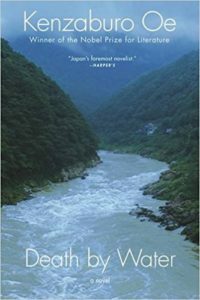 Excited to finally be able to finish the “Drowning Novel” about his father that he had begun decades earlier (to the dismay of his mother), Kogito decides to visit their old family home in Shikoku and to write what he believes will be his final novel – and his masterpiece. There is an interesting line in the book where the author’s mother accuses him of not having any fantasy, only imagination, which is supposedly always based in reality. And the book does feel very autobiographical, but many other things are unrealistic: Would you leave your house to a woman whom you barely know, instead of to any of your own children? Anyway, while I didn’t particularly like this book, I am still curious about the author, and I will see if I can read more of his novels. Kenzaburo Oe was born in 1935 in Shikoku, and started to study French literature when he was 19. His first stories were published in 1957, heavily influenced by contemporary French and American literature. Oe has been political from his early beginnings as a writer, for example, he has written about Hiroshima’s a-bomb victims, the atrocities of the Japanese military on Okinawa; currently he is very active in the anti-nuclear movement in Japan. His first literary prize was the Akutagawa prize in 1958, and in 1994 he received the Nobel Prize for literature.